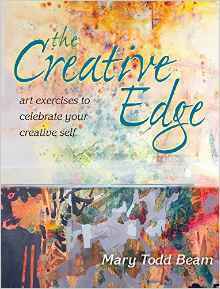 The Creative Edge takes you on an amazing exploration of your own artistic potential. Building on basic creative processes, artist Mary Todd Beam invites you to go deeper into your observations and experiences following more than 25 techniques that will take your work in exciting new directions. Through Mary's insightful instruction, you'll heighten your awareness of color, texture and designs as you infuse your work with symbols and metaphors of special significance to you. At the end of each exercise, you'll experience the joy and satisfaction of creating an expressive finished piece that is uniquely your own. From the elements of visual language to the objects that eternally inspire us, each section of this transformative book focuses on a different artistic component or subject. To provide you with as many sources of inspiration, Mary also features examples of her own work along with paintings from guest artists who share their own insights and ideas about artistic expression and the creative process.